WASHINGTON (CNN) -- FBI Director Robert Mueller pointed Monday to recent terror attacks in Mumbai, India, and Somalia to highlight the FBI's concern that small groups or individuals could carry out such attacks on U.S. soil. 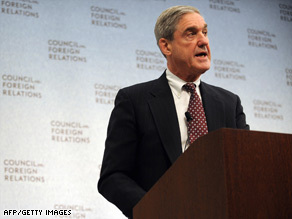 FBI Director Robert Mueller says he worries the Mumbai attack could be replicated in the United States. In a speech to the Council on Foreign Relations, Mueller worried that the dramatic terror attack on hotels and other facilities in Mumbai potentially could be replicated in the United States. "This type of attack reminds us that terrorists with large agendas and little money can use rudimentary weapons to maximize their impact. And it again raises the question of whether a similar attack could happen in Seattle or San Diego, Miami, or Manhattan," Mueller said. He said he is increasingly concerned with "pockets of people around the world that identify with al Qaeda and its ideology" but who have little or no actual contact with al Qaeda. Mueller cited the first-ever suicide bombing by a naturalized U.S. citizen last October. A Somali native who had settled in Minnesota traveled back to Somalia and blew up himself and 29 others. The idea that Shirwa Ahmed, 27, was radicalized in the United States raised red flags throughout the FBI. "One pattern in particular concerns us," Mueller said. "The prospect of young men, indoctrinated and radicalized within their own communities and induced to travel to Somalia to take up arms -- and to kill themselves and perhaps many others -- is a perversion of the immigrant story. And it raises the question of whether these young men will one day come home and, if so, what they might undertake here." Authorities have said as many as 20 young Somali men reported missing in Minnesota may have returned to Somalia to take up arms.